He doesn't want to admit it, because he's too nice, but deep down inside, I know he does. I bring back almost everything to have him re-do them. It's not my fault, if he listened to all my requests the first time around, he wouldn't have to do it again. Sorry dude. I adore this outfit! You look amazing! 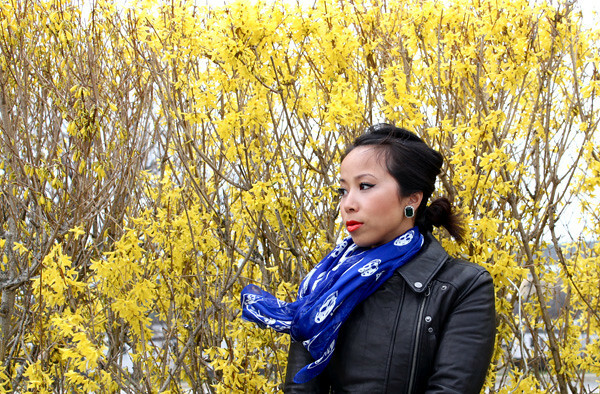 love your liptstick with that cobalt scarf!! i am sure your tailor loves you! Maybe time for a new tailor? I love mine with a passion. You look adorable; I love your jacket! love love LOVE that lip color on you! so spunky. you have such a pretty smile! Love the scarf, and bag. In other words, I love your scarf. haha. Love that lipstick on you. did you end up re-shortening the sleeves? you were right, they do look great at this length! barely noticeable, but it looks JUST right. cool outfit, love the scarf! and your makeup is always so flawless too! NOTHING beats a great pair of worn in jeans and a leather jacket. LOVE THIS!